“teachers shouldn’t have to answer emails or mark homework after that cut off point to ensure that teachers were able to spend their time focusing on what they are passionate about”. 1. Fund time to plan/mark/collaborate. Ask any teacher and I’m pretty sure one of the main prohibiting factors to deep, reflective and truly meaningful professional development is time. And ask any headteacher or school business manager and I would anticipate the biggest consideration for them is funding the time to enable this to happen. Increasingly schools are exploring innovative strategies to facilitate action research, collaborate effectively and create opportunities to plan learning with colleagues from different faculties and students too. Doesn’t this sound like education nirvana? Hopefully yes, so why isn’t funding forthcoming to enable schools to do this, but instead year on year being cut? Most tasks are not unnecessary but with so many students and so many classes it all aggregates into an unmanageable workload. Marking, tracking, recording poor behaviour, reporting, planning – all of it becomes difficult to achieve when classes are so large and we have so many classes. (Classroom teacher, secondary) It is important to clarify that many respondents noted that the tasks they undertook were not ‘unnecessary’ or ‘unproductive’ as the survey question asked – indeed, they recognised that they were essential parts of working within a school. However, it was the level of detail (63%), duplication (45%) and bureaucracy (41%) that occurred during these tasks that they felt were the ‘unnecessary’ or ‘unproductive’ aspects of them. 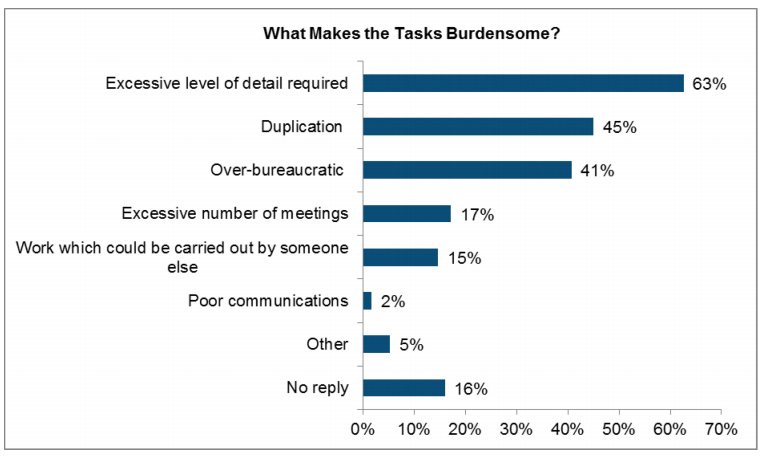 Respondents most commonly said that the burden of this unnecessary workload was created by accountability/perceived pressures of Ofsted (53%), and tasks set by senior/middle leaders (51%). Working to policies set at local/school level (35%) and policy change at national level (34%) were also significant drivers for teacher workload. The most frequently mentioned source of unnecessary and unproductive workload, according to 82% of respondents, was within the category of lesson planning and policies, assessment and reporting administration. Most common unproductive work areas. “Tell us about the unnecessary and unproductive tasks which take up too much of your time. 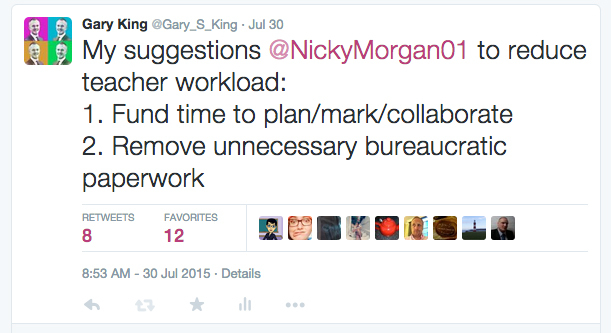 Where do these come from?” Workload Challenge survey, 2014 (sample base = 1645 respondents). Teaching and learning is the one big thing that really does make a difference, it’s front line in the classroom with maximum impact upon students’ learning. These findings illustrate the need to create time and also look to reduce/remove unnecessary bureaucratic paperwork/tasks. Lets leave teachers to do what they do best – Teach! 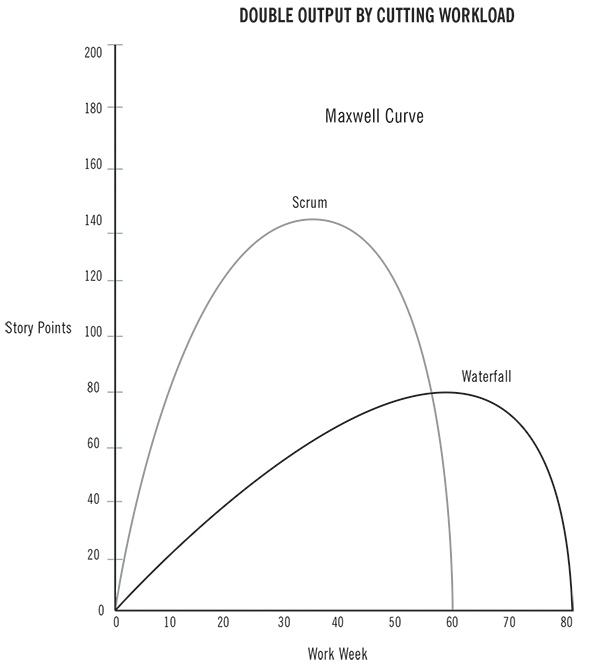 The y-axis is productivity, and the x-axis is hours of work. The peak of productivity actually falls at just under 40 hours a week. In the book it goes onto say that telling people that working late wasn’t a sign of commitment—it was a sign of failure. It’s not necessarily about having a balanced life, it’s about getting more stuff done. Unfortunately, schools simply cannot choose to reject the DfE and Ofsted’s accountability agenda, which seems to drive a high percentage of stress, excessive ‘box ticking’ and instability within the current education system. And we cannot even begin to question the dedication of teachers and the obscene amount of hours worked in an academic year, I’m no mathematician but just a quick calculation would indicate the average teacher works 60 hours per week, based upon this very broad assumption it’s possible to suggest the average teacher works approximately 2000+ hours during an academic year, so it does beg the question, considering the Maxwell Curve; How much more effective and ‘healthy’ would the teaching profession become if the principle of ‘less is more’ underpinned it’s mantra? Surely therefore, taking all this into consideration, the recruitment crisis we are facing isn’t just down to a frivolous comment to address workload by simply banning emails after 5pm, instead it’s far deeper than a sweeping political statement. The wider culture in education which is being driven by politics and policy makers isn’t healthy, call me old-fashioned, but in my humble opinion education should not be or ever become political. The development of our young people (our future generations) needs to focus on a wider skill set than the ability to pass examinations alone. To address this, we need to release the potential in all our teachers and education leaders, prioritsing this as a matter of urgency. Food for thought as we approach a new academic year. This is what we are just starting out with at my school – I have been deputy since January. The parallels and barriers to development seem really obvious to me but the prevailing culture is proving hard and slow to shift at a whole school scale. I am going with three main aspects: 1) banging the drum for doing half as much twice as well all the time as we compromise our standards on a daily basis in the name of getting everything done. 2) Every change starting small and with volunteers akin to your style = no diktats, though I am baffled at how reluctant some colleagues are at being engaged in discussion and actually prefer to be told what to do, which is sad and will take time to change. 3) Professional discussions about planning, quality of work etc to be much more regular, lower stakes and hopefully valued/valuable to staff. Alongside this I am working hard to ensure that everyone is ‘seen’ and engaged with their own development and anyone not willing to engage with an open mindset will be invited to work somewhere else, ideally not another school! Ultimately we hope to gain a reputation amongst teachers locally that our school is the place to be. Yours seems like one I would love to work at, from what I have read so far. Keep up the good work with the blog – I am aiming to write my first on this holiday but made similar claims last year. This link is the most interesting story of school development I have ever heard. Again almost everything rings true for what our system needs and, later on, does not need. The most reassuring thing is the emphsis that the positive changes take a heck of a long time and are borne of people sharing good relationships which I have experienced at all the schools I have been at, so am confident can be replicated in other settings. Highly recommended if you have not already heard it. I would put it up there alongside the Austin’s Butterfly video. Sorry for the ramble – procrastination in order to stop me writing an actual blog! Thanks for this Gareth, a very insightful piece. Never stop banging the drum, there will always be sceptics. I’ve found the tipping point is when the ‘critical mass’ shift from seeing colleagues engaging with impact. It has taken me three years for (hopefully) staff to trust with confidence in my leadership. More than happy to share ideas over the phone in September?